When a new employee comes on board, it’s important that they understand the company’s goals, mission statement and expectations. They need to be prepared for all of the factors that their new career at your company entails. When going over everything with a new employee, it’s a good idea to have the employee orientation checklist on hand. With the new employee orientation checklist, you will have a record showing that a new hire has been shown everything required to perform their duties at the highest level possible. Another added perk of the new employee orientation checklist for business owners is that it’s free. Simply click the download button located on this page to get started with the template today! The new employee orientation checklist is an Excel template from Microsoft. It’s formatted so that it’s ready to print, but it can also be converted to a Word document or a PDF file if you so choose. 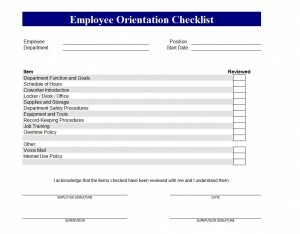 The employee orientation checklist is also customizable. Feel free to make any alterations, changes or adjustments that would make it more effective. Once you’ve gone over an item with a new hire, simply check the corresponding spot on the new employee orientation checklist. Repeat the process throughout the list. Once everything has been covered, the employee will sign and date the document to acknowledge that the items checked have been reviewed and they are understood. Once autographed, the supervisor will then add their name and signature to the document to complete the employee orientation process. Make your next orientation a breeze with the complimentary new employee orientation checklist. Download and print it for free today!